GracefullyVintage: 15 Favourite outfits of 2015! 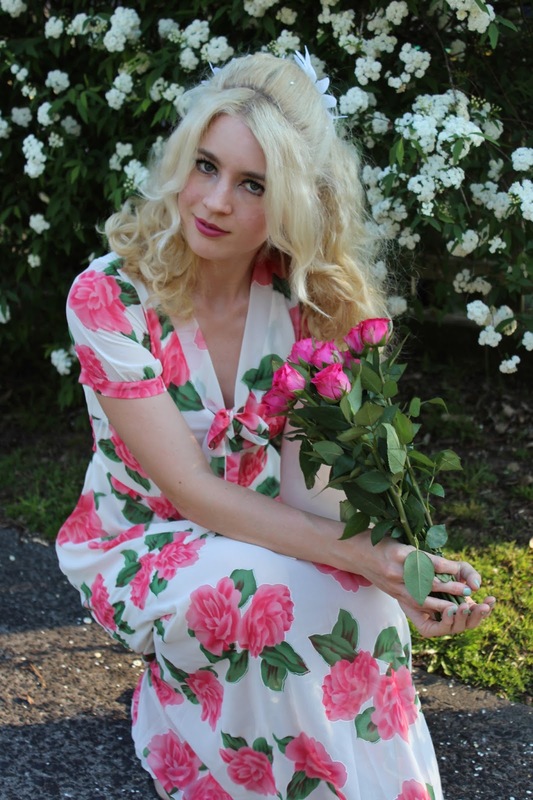 I will forever be in love with this dreamy silk 50s dress and it is made by an amazing Australian brand too! Too complete the look I styled the dress with a pair of my Vivienne Westwood-Melissa heels, a vintage beaded purse and vintage gloves to complete the look. This jumpsuit was one of my unicorns and when I finally found it I was over the moon. I have already worn it a number of times and it has to be one of the garments that I own. The fabric is beautiful, the fit makes it a perfect summer outfit and it is just so timeless. I just love it so much and it started my obsession with jumpsuits and maxi dresses. My first 60's mod look was back in July and I have been growing my collection of mod dresses ever since! This style captures my kooky, happy self and I look forward to exploring it even more. Okay, I am addicted to Collectif coats and jackets and I had to make this one mine earlier this year. The pink and grey are perfect together, the faux fur is so soft and I had to pair it with pink earmuffs. I'm looking forward to winter so that I can wear it again! I am no stranger to nautical clothing and in fact it takes up a good portion of my wardrobe, I also spend a lot of time by the water so it's no surprise that I have added plenty of nautical themed pieces in my wardrobe. This Voodoo Vixen dress has been a favourite for me this summer, it's cute and perfect for my surroundings... Yes, I was very happy this particular day whilst wearing it at the waterfront as you can see! One of my wardobe goals of 2015 was to add more pants to my wardrobe and I now have plenty of them. These Collectif trousers are so comfortable and so much fun to wear, I have them in houndstooth as well. This outfit was quite simple but a bit sassy, I love wearing berets during winter too! This 60s inspired outfit was very glamorous but quite relaxed at the same time. This Angie Lu dress is just so gorgeous and comfortable that I am packing it to take on holiday and it gets bonus points for being lightweight for both the warmer season and packing in my suitcase. Fringed dresses are amazing, dancing in them is fun... Even just walking whilst wearing one is great. I fell in love with this ombre dress by Unique Vintage and I was literally dancing in the street. This also marked my best finger wave set ever! I can't have a round-up post like this and not include one of my other favourite things, swimwear. This Sirens Swimwear floral number gave me serious 60s vibes, I love this Aussie swimwear label. Gingham has always been a favourite for me and when I first saw these Collectif cigarette pants I drooled over them until they finally arrived on my doorstep, I ordered the top soon after. These Vivienne Westwood-Melissa Shoes were another perfect purchase this year. I consider this whole outfit a great investment and they were all purchased on sale so that makes it even better! Another jumpsuit to add to my obsession and now I want it in all of the other prints. I love the little dogs print on it and I had to wear this Erstwilder brooch too as it resembles my dog Fifi + I like to team with the theme. This was my first attempt at finger waves and I don't think it was too bad, they have gotten better though. This was also my first flapper dress, I have always loved 1920's fashion and I was finally able to live the flapper showgirl dream. I look forward to growing my collection of 20's dresses in 2016. Maybe it was this yellow Sun Jellies tote bag that started my obsession with all things yellow, I don't know but I loved pairing it with my matching swim cap. These photos were taken after a big dog walk and Fifi & Leo just sat next to me to have a little break and our little beach lifestyle was captured. We were looking at some other dogs in the distance and we were getting ready to hit the water as it was a hot sunny day! You can't go wrong with a classic white swimsuit either, this one by Red Dolly Swimwear is too cute. When dresses remind you of ice-cream it has to be a good thing, right? I am ready to pull this dress out of my wardrobe to wear during summer as it is perfectly sweet and wonderful for twirling... Twirling is very important! Another coat, but this time 60's style! When Collectif released their new line Bright & Beautiful I was pretty darn excited. I was also so happy that I had a chance to wear this out on a cool rainy day in November, I couldn't deal with having to wait until winter to wear it out. Thank you for following the blog this year and to the wonderful friends I have made. I look forward to another year of blogging! I love this compilation of all of your favourite posts. Some are new to me since I only started blogging/discovering more blogs this year, so it's nice to see some looks I haven't seen of yours before! What a treasure trove of classic, charming, beautiful style. I love that you opted for 15 favourites to celebrate the year that we'll soon be parting ways with. Clever idea! So many great outfits and photos! It's so much fun to see what you pick out as your favorites from the year. I really love 1960's style on you! #3 and #15 are two of my favorites on you but I also really love #4 and the picture of you with your dogs at the beach #13 is just amazing! Fantastic round up!!! Incredible looks! I have really loved following your blog this year, so much fab inspiration. You always look gorgeous! Happy new year!!! Wow your outfits are stunning and perfect. I have so many favourites- the coats, the tartan, mod dress, nautical dress. WOW.